Using the Mobile Stair Calculator is very easy. If you accept the pre-set values in the drop-down select boxes, then the only value you need to enter is the Total Height [A] of the landing or deck that requires stairs. Use the stair diagram as a reference so that you can see how the	input and results attributes are mapped to the stair parts. To see how the Mobile Stair Calculator works, try entering a value in the first input field [A], and click the Calculate button. The results will appear in the "Results" fields. You can also change the values of the Step Height, Tread Thickness, and Tread Depth, by selecting another value from the select menu. After changing any of the values, you must click the Calculate button again to recalculate the results. 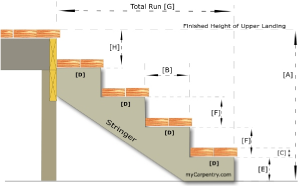 Visit building stairs, at my carpentry.com for more information on stair building. You can also check out the non-mobile version of this stair calculator.